Description: Jeanne d'Albret, born in 1528, is the only daughter of the King and Queen of Navarre. Standing with her beloved Huguenots, Jeanne steps onto the battlefield of history during the tumultuous years of the Reformation (1517-1559). As deadly political events swirl around her tiny Kingdom of Navarre, Queen Jeanne is forced to choose: Will she hide the fleeing Huguenots under the very nose of Catherine de Medicis's henchmen or save her own life? The Chosen Daughters series highlights the lives of ordinary women who by God's grace accomplish extraordinary things. - Publisher When she converted to Protestantism, Jeanne found freedom of conscience. She hid Reformed ministers who were being persecuted, and she built schools and hospitals. 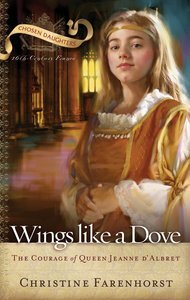 About "Wings Like a Dove"
When she converted to Protestantism, Jeanne found freedom of conscience. She hid Reformed ministers who were being persecuted, and she built schools and hospitals.